Dereel State School & Districts Honour Roll commemorates those who served in World War One. This honour roll is unusual in that the crown on the honour roll is the one used to depict that a Queen is the reigning monarch, rather than a King. 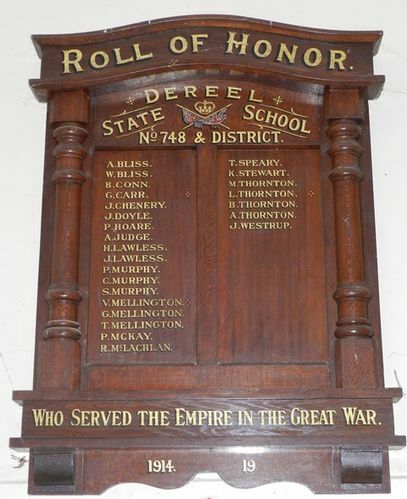 The Dereel Honour Roll containing 25 names of local citizens who have served their country in the Great War, was unveiled under auspicious conditions on 14th December in the Dereel State School. The Honour Board was made from Queensland silky oak and made by an Australian firm R Tunbridge and Sons. Mr D.C. McGrath M.P. was invited to unveil the roll. Berringa Herald (Vic), 21st December 1918.
WHO SERVED THE EMPIRE IN THE GREAT WAR.